I have some Halloween party food recipes that are so easy to make, cute, gory, scary and delicious. 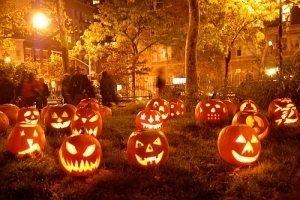 I have homemade Halloween make up, candy, beverages, treats and more below. Boo. My neighbor sent these Halloween recipes to me years ago and I hope you enjoy them as much as I do. 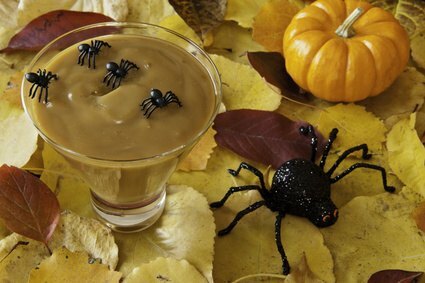 I love butterscotch pudding and thought I would add it to my Halloween Party food lineup. Beat the eggs and vanilla together; set aside. Put butter and brown sugar in a large skillet, melt and caramelize (bring to a boil and brown - do not burn this mixture). Carefully add water to sugar mixture and bring to a boil; cooking for 1 minute. Mix milk, salt and cornstarch together in a bowl and add this to the brown sugar mixture. Stir constantly to keep mixture from getting lumpy. When this gets thick and bubbly, cook for one more minute. Slowly add 1/2 cup of the hot mixture to the eggs and mix well to temper the eggs. Then add the remaining mixture to the rest of the sugar mixture and continue to stir to keep it creamy. You don't want lumps. Cook for another minute. This can be used as filling for a butterscotch pie. This is a wonderful Halloween party food idea. Kids love it. PREHEAT oven to 400 degrees. Line the cookie sheets with parchment paper. Sift the flour, baking powder and salt together; set aside. Cream the butter and sugar until smooth and fluffy. Beat in the eggs, one at a time, and mix well after each addition. Add the vanilla. In 1 cup measurements, add the dry ingredients to the creamed mixture; mixing well after each addition. Cover and chill the dough for at least 1 hour. Roll the dough out on a sugared surface (do not put flour down) to 1/2 inches thick. Cut into shapes and place carefully one inch apart, on the prepared cookie sheet. Bake for 6-8 minutes. 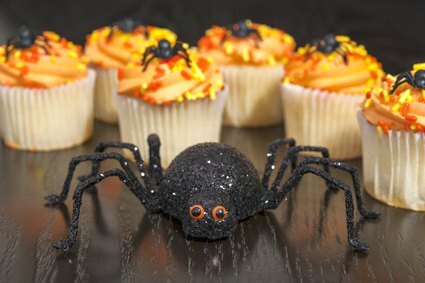 Nothing is more scary (or delicious) for that matter, than this Halloween party food idea for cupcakes. PREHEAT oven to 350 degrees. Place cupcake liners in muffin tins. Cream butter and sugar together for 5 minutes until light and fluffy. Add eggs, one at a time, and beat well after each addition. Add banana, cooled chocolate and vanilla. Sift flour, measure, and then sift with salt and soda. Add alternately with buttermilk to make batter. Bake in prepared cake pans and bake for 30 minutes. Leave in pans for 10 minutes, then remove and cool completely. Frost with fluffy white frosting below. In a saucepan, stir together the sugar, water and cream of tartar. Cook over medium-high heat until the sugar is dissolved and the mixture is bubbly; this may take several minutes. In a medium mixing bowl, whip the egg whites and vanilla to soft peaks (several minutes). Gradually add the sugar mixture while whipping constantly until stiff peaks form, about 7 to 10 minutes. **NOTE This recipe calls for orange food coloring (which I do not use). The India Tree Natural Decorating Color - Orange uses vegetable colorant (no chemicals or preservatives). Add 3 cups of the peanuts into the food processor and process for 2 minutes. It'll take that long for the nuts to break down and become oily. When it is almost smooth, add the peanut oil and process again for a minute. Then add the last cup of nuts and process until you have reached the desired chunkiness you want. I don't want to overstate it but - this is the best peanut butter you'll ever eat. Make peanut butter cookies - your family will flip. Just wash the celery and fill with the peanut butter. What do you know, Halloween party food that's healthy. 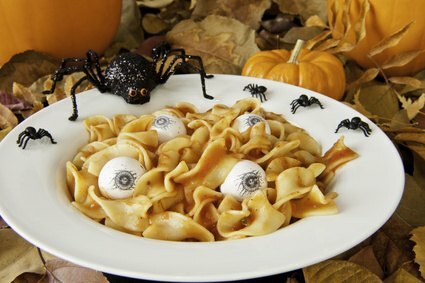 For this Halloween party food, you need to cook egg noodles and add a little bit of your favorite pasta sauce. Then place eyeballs in with the noodles and you will have "Brains and Eyeballs" for the kids. With rubber spatula, blend shortening, cornstarch and flour to form a smooth paste. Add glycerin for creamy consistency. This should yield enough for a child's face. This Halloween grease paint can be easily removed after the last trick or treat with shortening, cold cream or baby oil. Now on to my Halloween party food recipes. 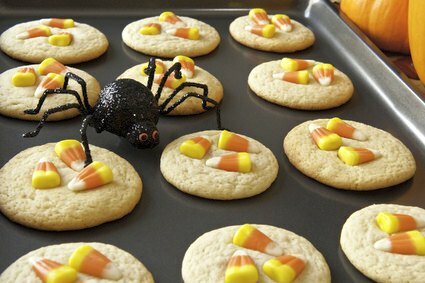 This is a fun Halloween party food recipe that kids can help decorate. Stick marshmallows into 4" lollipop sticks and place them in the freezer for about 15 minutes, until they are cold. While the marshmallows are chilling, melt the chocolate in a double boiler or in the microwave. Remove the marshmallows from the freezer and dip them lightly in the melted chocolate for a thin coating. To get a mummy look, swirl them a bit to look like layers of white wrapped around it. Ghosts should be dunked to make a little twisted peak on top. Frankenstein can be dunked and a spoon used to flatten the chocolate on top. Push the sticks into a block of styrofoam to cool. If you stick them in the fridge it shouldn't take long for them to set up. Add faces after they harden. Using a small tube of black decorating gel, with a small tip, carefully paint on two ghostly eyes onto the marshmallow. Add a little mouth as well. Cut up frozen banana and place all ingredients in a blender. Process on high until smooth. Pour into two tall glasses and serve. Top the shake with whipped cream and a shake of cinnamon. It is apple picking season, and Halloween is approaching. Following is a family favorite and great for parties. Insert wooden stick into each washed and dried apple. Cover tray with wax paper. Stir together peanut butter chips and oil in medium microwave-safe bowl. Microwave at HIGH 1-1/2 minutes or until chips are softened. Stir until melted. If necessary, microwave at HIGH an additional 15 seconds at a time, stirring after each heating, just until chips are melted when stirred. Stir together powdered sugar and cocoa; gradually add to melted chip mixture, stirring until smooth. Microwave at HIGH 1 minute or until very warm. Roll lower half of coated apple in coconut or chopped chips,Chopped Peanuts if desired. Allow to cool on prepared tray. Refrigerate, if desired. Using an ice cream scoop, place 2 scoops of ice cream for eyeballs into 10 dessert dishes. Place a cherry on each scoop for the pupil. Freeze for 30 minutes, or until firm. In a large bowl, stir boiling water into the gelatin around the eyeballs in each dish, leaving the top of the eyeballs exposed. Freeze until ready to serve. Combine ingredients, except dry ice. Once guests begin to arrive, add dry ice and serve. Take a clean rubber glove and fill it with water, tie it and put it in the freezer. Keep it in there until your party. When you're ready, take it out of the glove and put it in the punch bowl instead of ice. Ta da. 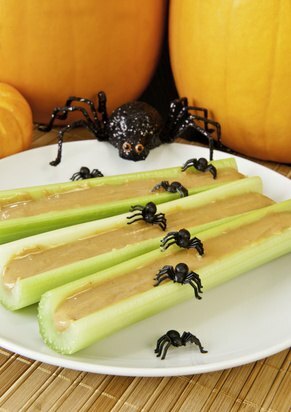 This is a really great Halloween party food treat for the kids. PREHEAT oven to 350 degrees. Line cupcake baking pans with paper cupcake liners. In second small mixing bowl, combine water, vegetable oil, vinegar and vanilla. Add contents of small mixing bowl to large mixing bowl and stir with mixing spoon to combine. Using mixing spoon or soup spoon, fill cupcake liners half full with cupcake batter, then place 1 teaspoon filling at center of each. As cupcake bakes, the batter will rise to surround the filling. Bake approximately 25 minutes or until cupcakes test done. If desired, frost with orange icing, or just let the orange filling ooze out as a surprise. PREHEAT oven to 350 degrees. Cover 3 cookie sheets with foil. Cream butter and sugar together. Add egg and vanilla extract. Beat in flour, baking powder and salt. Add milk if batter is too stiff. Color all but 1/8 of the dough orange and color the rest green. Roll 1-inch balls from the orange dough and flatten with your hand to make a pumpkin shape. Place on cookie sheets. Roll stems out of the green dough and attach to the top of the " pumpkin". Carefully cut out wide spaces for the eyes, nose and mouth with a knife. Fill holes in with crushed lemon candy. Bake for 8 to 10 minutes or until done. DO NOT ALLOW TO BROWN. Allow to cool for 10 minutes and carefully peel off foil. *Crush lemon drops in food processor. If mixture becomes sticky, add a little powdered sugar while chopping. I got this from Martha Stewart.com. I made them for Halloween and it was wonderful. The kids just loved it (most of them) some was a little scared. You will need plastic gloves like they use in the food service business. Just make sure you don’t get the latex gloves with the powder in them. Buy some plastic decorative kids rings, you can usually find them in packs of spider rings. Pick up some candy corn and popcorn (buy popcorn in the bag like white cheddar and just pop it yourself). In each glove finger put candy corn in for the fingernail tips. Fill with popcorn and place a ring on a finger. Tie off with either black or orange yarn or ribbon. I actually ran out of them at Halloween they was such a hit. Dip Nutter Butter cookies in white almond bark and use mini chocolate chips for eyes. Lime sherbet, with 7up poured over it. It's slimy and green and it tastes great. Another Halloween party food below. You need the very large marshmallows like you would take camping. Cut the corners off the bottom to make them look like diapers. Cut an opening in the top of the diaper. Use a decorating bag with a small tip, or use a sandwich bag with the corner snipped, to fill the diaper with melted caramels or caramel sauce. You can serve lemonade with them to have a "matched set." You can say they are Monster Pee-Pee and Dracula's Dirty Diapers. PREHEAT oven to 275 degrees and lightly grease baking sheet. Beat first five ingredients in a small bowl at high speed until soft peaks form. Add sugar gradually, a tablespoon at a time, beating until stiff peaks form. Mix in cereal. Drop by level tablespoonfuls onto lightly greased baking sheets. Make an indentation in center of each with the back of a teaspoon. Place 3 candies in the indention. Bake at 275 degrees for 30 minutes or until set. Remove at once and cool on racks. Store in an air-tight container. Grease cookie sheet with oil, set aside. Carefully cut chicken breasts partway to create five fingers (the uncut part will be the palm of the hand). Slice them a little crooked for effect. Dust in flour, dip in egg, coat in bread crumbs, broil 5 minutes each side till golden and cooked through. Trim the tips with the olive fingernails and serve on lettuce. In a large bowl, dissolve gelatin in boiling water; let stand at room temperature for 30 minutes. Stir in cinnamon. In a large measuring cup with a spout, beat milk and pudding mix until blended, about 1 minute. Quickly whisk into gelatin until smooth. Pour into a 13x9x2-inch pan coated with cooking spray. Refrigerate for 3 hours or until firm. Cut into ovals or use an egg-shaped cookie cutter. Serve over alfalfa sprouts if desired. NOTES : May also be made in Jell-O Jigglers egg mold. Coat the inside and rim of each egg mold with cooking spray. Securely close each egg mold. Place mold, fill side up on a tray. After whisking pudding mixture into gelatin, immediately pour it into the mold through fill holds just to the top of the egg shape. Refrigerate for 3 hours or until firm. To unmold eggs, slide a dull, flat knife between eggs. Gently pry between each egg (do not pull the handle). Turn mold over and shake gently to remove eggs. More Halloween party food below. Makes about 18 decrepit digits. PREHEAT oven to 350 degrees. Sift the flour and place it in a small mixing bowl. Add the cornstarch and salt. Stir together with a fork and set aside. Place butter in a large mixing bowl and cream with an electric mixer. Sift in the sugar. Mix together until batter is fluffy. Add vanilla and pecans and blend well. Now slowly pour the flour mixture into the butter mixture, and combine until dough appears crumbly. Place a piece of waxed paper about 12 inches long onto a smooth work surface. Place the dough on top of the waxed paper, and cover it with another piece of waxed paper about the same size. With a rolling pin, roll out the dough to 1/4 inch thick and slowly remove the top piece of paper. Slice the dough with a butter knife into oblong shapes about the width of your middle finger. Use a metal spatula to lift the fingers onto an ungreased cookie sheet, making sure you leave about 1 inch in between each finger. To give fingers an old and knotted appearance, bend some of them sideways at the knuckles. Use slivered almonds for each fingernail. Place baking sheet in the oven for 12 to 15 minutes. Then remove with potholders and transfer the cookies with the metal spatula to a wire rack to cool.